If you’re looking to change up your style, new dining room furniture can totally transform a space. The festive season is the perfect opportunity to spruce up your home; you’re already decorating it, why not go the whole way? Velvet is an interior trend that came back with a storm for SS18 and isn’t showing any signs of slowing down. 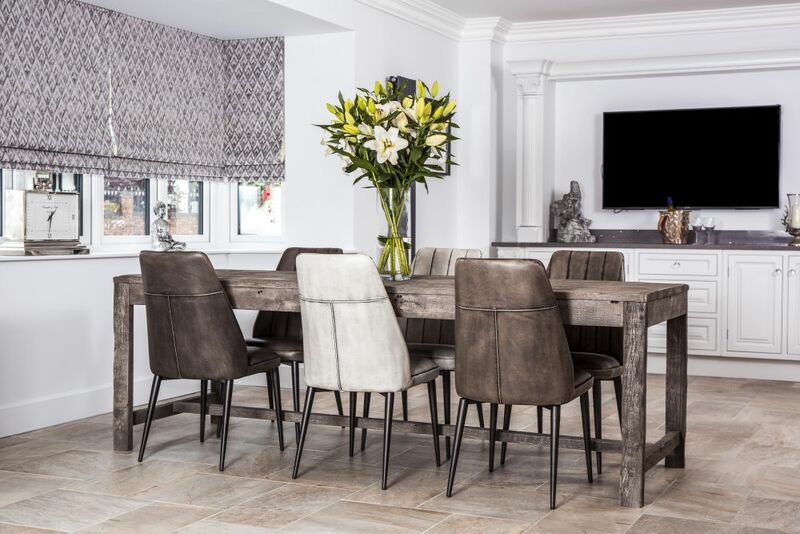 Velvet dining chairs are a fantastic way to add colour and texture to your dining room, and they go surprisingly well with a variety of dining table styles. The white washed ‘Havana’ table is perfect for a fresh, modern kitchen dining area. Pair it with the smoky black ‘Chamonix’ chairs for a subtle introduction to velvet. The contrasting colours really bring out the best in each other, and pay homage to the ever-fashionable monochrome look. 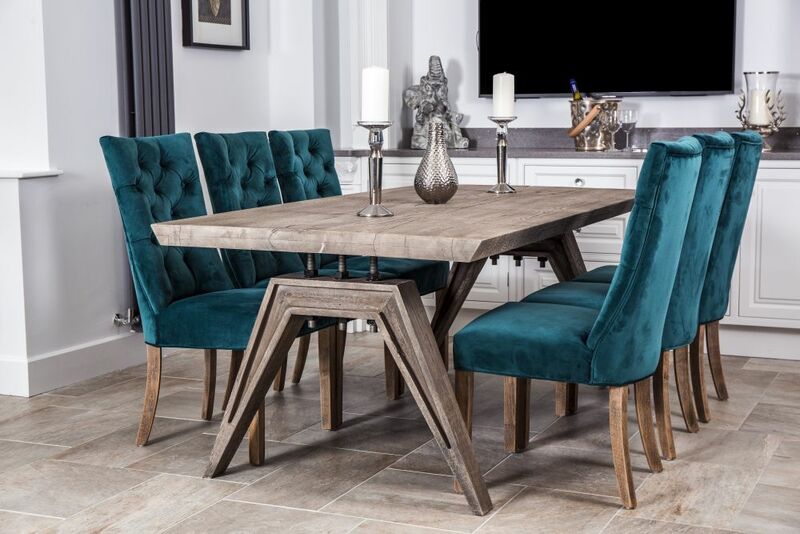 The chairs’ rich velvet upholstery completely changes the tone of the rustic pine dining table, adding instant elegance. If industrial style is more your thing, then the ‘Wilkins’ dining table might be the one for you. The chunky oak table top is attached to the unusual legs by large threaded bolts. You wouldn’t think it, but this quirky industrial style table looks amazing with the teal velvet ‘Brittany’ chairs. Dress the dining table with silver coloured accessories to pull the whole look together. One option for a dining room that oozes character, is the limed elm table and matching bench. 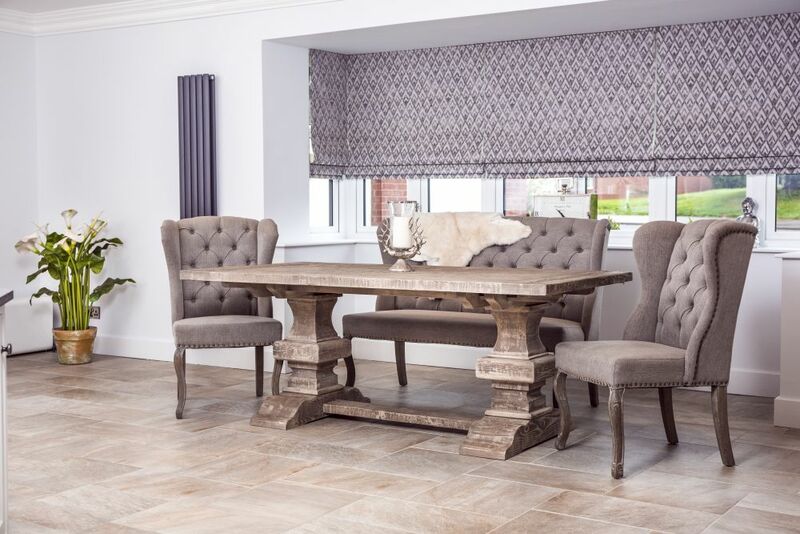 We’ve styled them with our grey velvet ‘Brittany’ dining chairs and chosen grey velvet ‘Chamonix’ carver chairs to head up the table. The carver chairs have stunning button back detailing that makes them fantastic feature chairs. Another design trend that we’ve seen a lot of over the past year is ‘hygge’. This Scandinavian concept adopts the view that less is more; it’s about mixing textures and utilising neutral colours to your advantage. 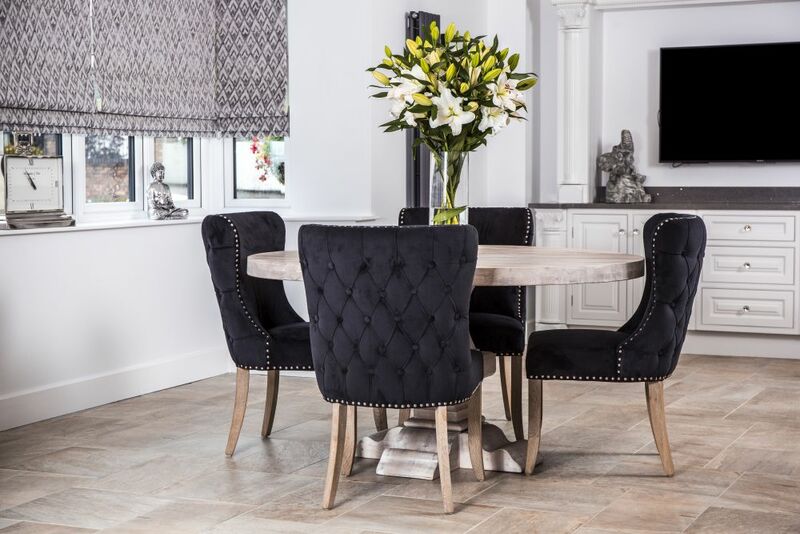 Our ‘Nelson’ kitchen chairs feature a minimalist design, with sleek black legs and delicate stitching. These chairs perfectly complement the ‘Miller’ dining room table, which is an ideal example of how simplicity can often pack a powerful punch. For an elegant look, our ‘Wellington’ table and ‘St. Emilion’ chairs are a winning combination. The ‘St. Emilion’ chair is one of our best sellers, with its linen upholstery and winged design proving very popular. The ‘Wellington’ table is a good choice for any household that spends a lot of time entertaining, thanks to its extending leaves – perfect for Christmas, too! Also part of the ‘St. 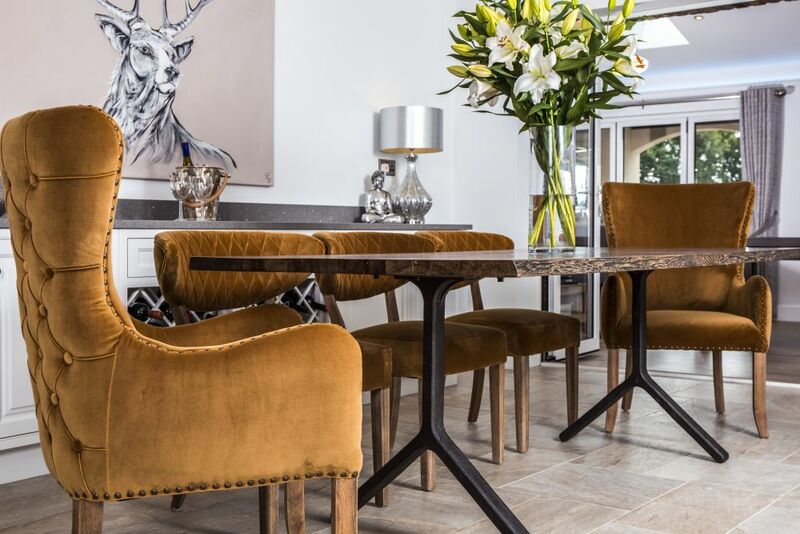 Emilion’ range is the matching dining bench, pictured here with a soft alpaca skin thrown over it as a plush accessory. 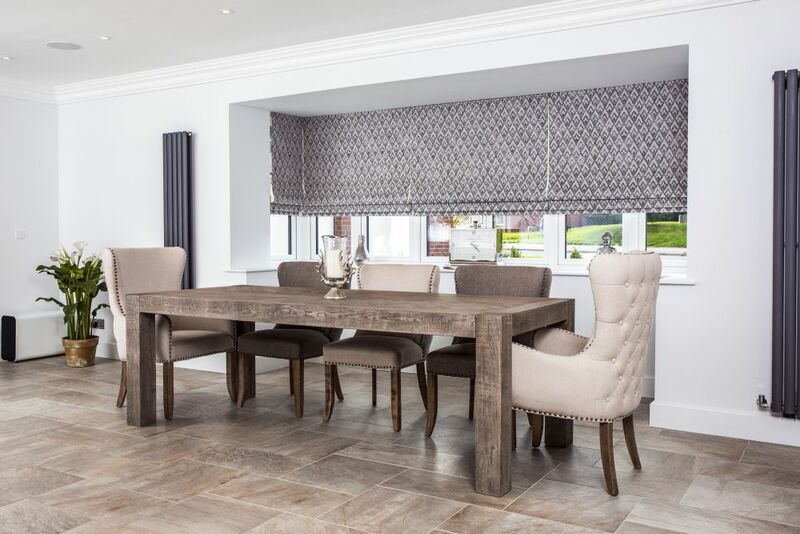 So, if you’re after a quick fix to transform your space, then new dining room furniture is a simple yet effective solution. Browse our full range of chairs and dining tables, or you can even create your own dining table with our Design Your Own Table range. Pictured left: Y-base table, mustard velvet 'Chamonix' carver chair, and mustard 'Orleans' dining chairs. 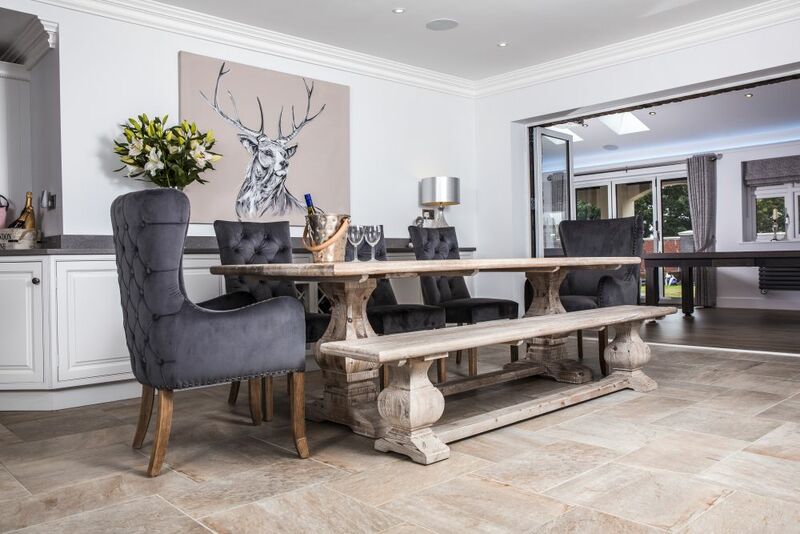 Pictured right: 'Herringbone' table, almond 'Chamonix' carver chairs, and almond and stone 'Chamonix' side chairs.